Add all of the gingerbread spice ingredients in a small bowl or jar and mix until completely combined. Preheat the oven to 375 degrees F. Prepare a 9×9 baking pan with parchment paper. In a large bowl, combine the cassava flour, cacao powder, baking soda, and gingerbread spice mix. Set aside. Bring a pot of water to boil. Add the chocolate, ghee, and applesauce to a heat-proof bowl (or a saucepan) and place over the pot of boiling water, being careful that the bottom of your bowl doesn’t touch the water. Bowl too small for your pot? I put a colander on top of the pot of boiling water and set my bowl inside, so it’s suspended over the water! Gently stir the mixture while the chocolate melts. Once the mixture is completely smooth, turn the burner off and remove the bowl from over the pot. Let cool for at least 5 minutes. Stir the coconut sugar, molasses, and eggs into the chocolate mixture, mixing until completely smooth. Add the wet mixture to the dry ingredients, stirring until it’s all wet and evenly combined. 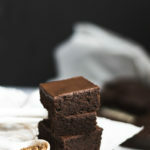 Pour into the 9×9 square baking pan and bake for 25 minutes, or until a knife inserted into the brownies comes out clean. Cool completely before frosting. To make the frosting, add the chocolate chips and ghee to a heat-safe bowl. Either melt the chocolate using the same method as the brownies (suspend the bowl over a pot of boiling water), or microwave for 20 seconds at a time until the chocolate has completely melted. Only frost the brownies after they’ve cooled! Let the frosting set before slicing the brownies and serving.